Your wedding day is going to be one of the biggest and most special days or your life. All the attention will be on you and your other half, and we know that you will want to look your best. You might have been considering cosmetic treatments before your big day to just give yourself a polished finish to your look, and we’re here to help you make the best decision for your needs. What types of treatments are out there and do you need it? Here, we’re taking a closer look. A cosmetic treatment such as a hair transplant may be something you have previously thought about if you or your partner has been suffering from hair loss. The aim of a hair transplant is to give you flattering, natural looking hair with no bald patches in sight, helping to make you picture-perfect for your wedding day. The hair transplantation cost can vary depending on the extent of the hair loss and the type of procedure you have, but it is certain to benefit you or your partner on a confidence level before your big day. A hair transplant is a common cosmetic surgery these days, so choose a well-known, reliable company so you know that the results will be the best. However, it is important to remember that you will need to wait a significant amount of time for your hair to grow back fully, so keep this in mind if you’re opting for a hair transplant before the big day. On your big day, the cameras will all be on you - quite literally. You have so many pictures taken that you will begin to think that you’re a celebrity! Due to this, you are going to want to have picture-perfect skin that looks flawless even when the flash is on, which is where a Fraxel laser can help. This procedure smooths lines and wrinkles and fades brown spots, while also rejuvenating your skin to give you that fresh, youthful look that you desire. This treatment is bespoke to each individual and what they want to be done, so each Fraxel laser treatment is certain to be unique. A benefit of this procedure is that you will be back to work within a few days, so you won’t have to take too much time off of work. However it will take some time until your skin will be picture-perfect, so don’t have this treatment too close to your big day! You may not have always been completely happy with your lips, so use this opportunity to change them. The first kiss is a vital part of your wedding day, so plump those lips up to help you seal the deal! Lip enhancement can liven up your face, simply by making your lips fuller by adding volume and making the vertical lip lines smoother, to give you a natural look. This is particularly good if you have very thin lips that you want to enhance and make bigger. Treatment doesn’t last very long (15-30 minutes) and the numbing wears off about 15 minutes after the procedure. Downtime is minimal, and you are likely to see the full results within just a couple of days – and these will also last between 6 to 12 months! Another way to ensure you are camera ready is to have Botox or other forms of dermal fillers. 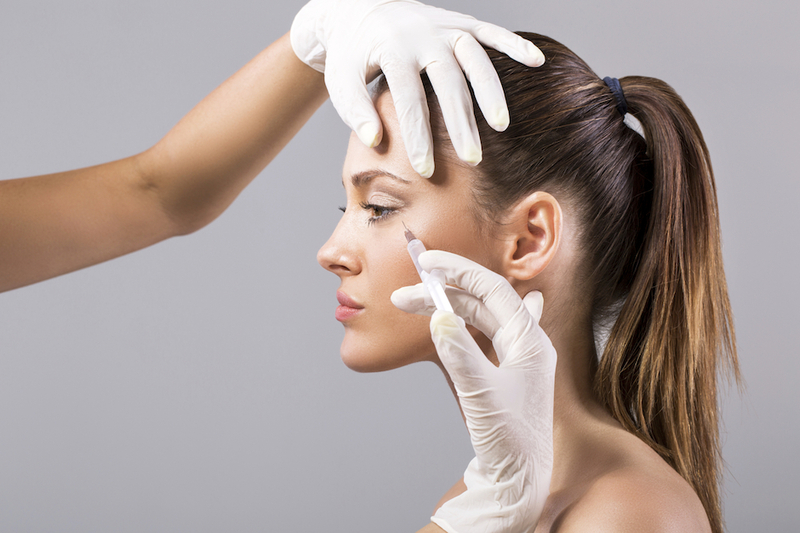 When Botox is injected, it sends a signal to the nerve muscles and temporarily paralyzes them. This can then reduce the appearance of fine lines and wrinkles in your face. The effects last up to six months so ensure to have it done with enough time to ensure that your treatment lasts for your big day. There is a complete range of cosmetic treatment available which are both invasive and non-invasive depending on the results that you require. Make sure to do your research before you decide which one you wish to have and you will look stunning on your wedding day no matter what!